Happy Monday! It's hard to believe we are technically still in Winter. With the time change yesterday, the gorgeous weather and our blooming daffodils, it's definitely feeling like Spring around here. I'm not complaining. Even a touch of the stomach bug this weekend didn't bring me down. LOL. If it's nice out, I'm a happy girl no matter what. Speaking of happy, here is a couple of page that make me happy. I created it for my GDT inspiration page at Webster's. 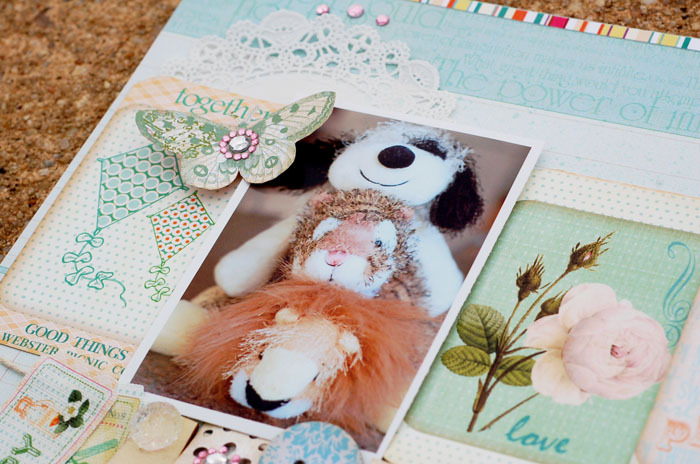 Carol Monson is our guest designer this month. 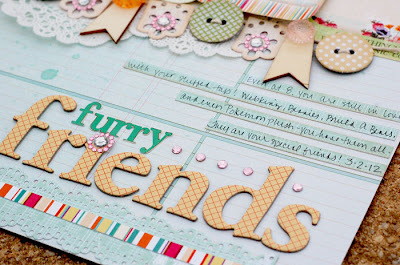 I love her work and had so much fun creating this page based on one of her's. This page is about Ryan's continued love for his stuffed animals. He has a HUGE pile of them and would add to it daily if I let him. Beanies, Webkinz, Pokemon Plush, Build a Bear and miscellaneous other friends 'adorn' his room and are piled on his bed. 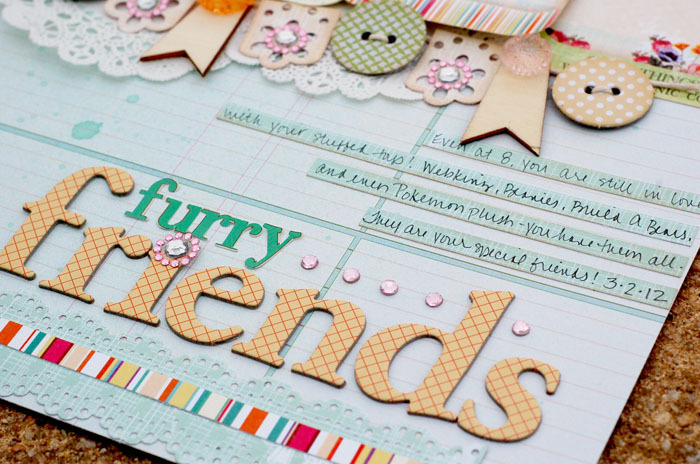 I used Sunday Picnic on this page. I keep reaching for this line because I love the colors and the versatility of it. You can go bright or 'pastely' like I did here. Overall, I really like how this one turned out! Judith. Big congrats to you, Judith. Enjoy shopping with your CD coupon. It´s a lovelly page, mY 4 years old son still love his stuffed animals too, soo I really thank you for the idea. 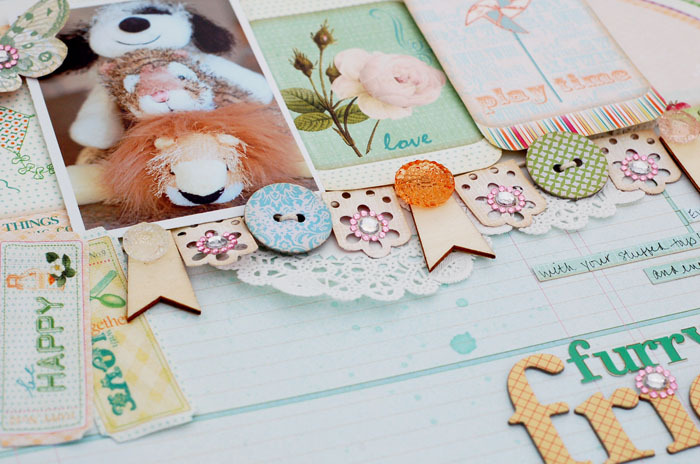 This is so adorable, I love your banner with all the buttons, so cute! So incredibly SWEET and LOVELY!! Very sweet page! Love the soft colors and pretty banner! Absolutely perfect!! Love the papers, designs, evrything. You rock! What an adorable page! I love the doilys under the banner! CUTE!! Awww! Furry friends... soooo cute! Love the softness of this one. So lovely! I ♥ your work! awww...this is so incredibly cute! love all the details on this lo !! !